Reports have been saying that Microsoft is now working on a new keyboard format for Windows Phone 8 called the curved ‘thumb’ keyboard. 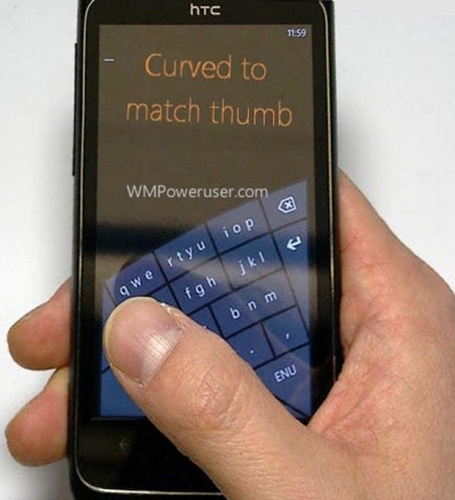 The photo above is a leaked Microsoft Research presentation that has revealed the upcoming Windows Phone keyboard designed to be used while one handed typing with your thumb. The keyboard is designed for one-handed thumb typing without having to look and features several keys clustered together, leveraging disambiguation to decide what word is in fact being typed. The change would be Microsoft’s most radical change to the Western SIP yet, and is reminiscent of the curved keyboards found in the old Microsoft UMPCs.